The majestic Straits of Mackinac and the Mackinac Bridge are the backdrop for the Old Mackinac Point Lighthouse, a historic lighthouse in Mackinaw City, Michigan. 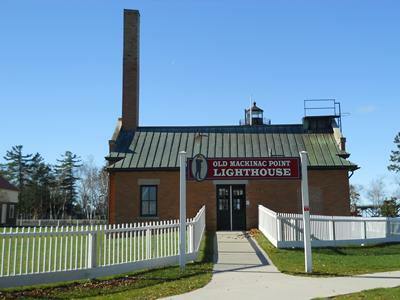 This Northern Michigan landmark was built in 1892 as a sentinel for the vessels entering the Straits of Mackinac from both the east and the west. 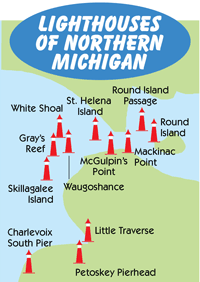 The Straits of Mackinac were--and are still today--critical to navigation. The McGulpin Point Lighthouse was put into action in 1869 as the lighthouse serving vessels entering the Straits from the West. 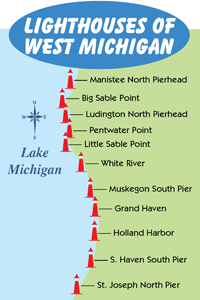 But a spot at the top of the lower peninsula overlooking the Straits of Mackinac allowed sight to vessels from both directions and Congress authorized a new lighthouse to be built. In 1890, a fog signal was placed at the spot as foggy conditions on the Straits was a navigational problem. The fog signal had its own building with twin steam boilers. The first year it was in action, 1890, it operated more than 300 hours using 10 tons of coal and 18 cords of wood. Two years later, the Mackinac Point Lighthouse was put into action with a fourth order fresnal lens. 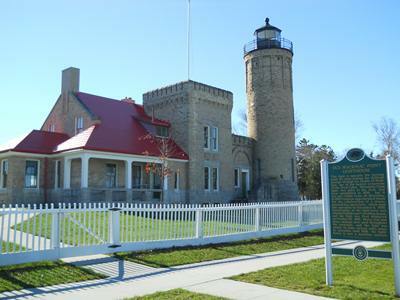 The tower and attached keeper's quarters were constructed with cream city brick, like the McGulpin Point Lighthouse, with Indiana limestone trim. The building housing the fog signal was demolished and brick building 50' way from the lighthouse was constructed for the boilers. When the Mackinac Bridge opened in 1957, its twin towers became the navigational marker for the Straits of Mackinac and the Mackinac Point Lighthouse was put out of business. The property was purchased in 1960 by the Mackinac State Historic Parks and was used as a maritime museum from 1972-1988. The fog signal building reopened as a visitors center in 2000 and the restored lighthouse opened in 2004. 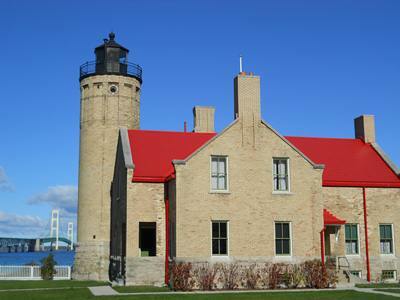 Visitors to adjacent Fort Michilimackinac can tour the Mackinac Point Lighthouse, with interpreters in period costume, climb the 51 steps to the lantern room and take in the spectacular view of the Straits, and climb even higher up the 13-rung ladder through the narrow open to where the fresnel lens once shown brightly. 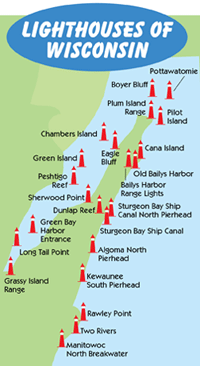 Tours of the Mackinac Point Lighthouse take place May-October. From June 11-August 20, hours are 9am-5:30pm. From August 20-October 9, hours are 9am-4:30pm. 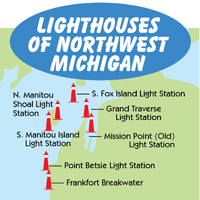 The Lighthouse is located in Mackinaw City just east of the Mackinac Bridge.